An ancient, archetypal evil meets a miscellany of modern motfis—such as surveillance and social media—in HEX, the first of Dutch wunderkind Thomas Olde Heuvelt's five genre novels (of which this is the fifth) to be translated into the English language. You may well have heard of the aforementioned author already; after all, he won the Hugo Award for Best Novelette in 2015, and was nominated for another unsettling short story, 'The Boy Who Cast No Shadow,' two years previously. 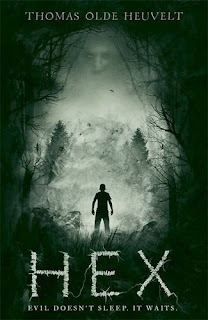 HEX is long-form horror, however, and long-form horror is hard, not least because the unknowable, on the back of which so much such fiction is built, can only remain so for so long before folks get sick and tired of not knowing. It's even worse than that, though. This too we know; that before the noose was wrapped around her neck—as "an act of mercy," (p68) if you can credit it—Katherine was made to murder her own son in order to save her dearest daughter. Little wonder, then, that she's been making life difficult for the residents of Black Spring since; so difficult that an infrastructure unlike any other has had to be erected around her. But, as so many studies have shown, people can get used to almost anything, however hellish. And let me stress that life in Black Spring has been pretty hellish for its three thousand residents. They can't even leave for long or Katherine compels them to commit suicide, whilst what little contact they can have with the outside world is monitored by men and women like Grim. Because of that bald fact, most people have adapted, but Tyler, for his part, isn't willing to let sleeping supernatural evils lie. He wants to be able to spend time with his girlfriend; he wants to go to college somewhere upstate; and one day, he wants to see the world: so he hatches a plan to expose the Black Rock Witch for what she is by posting videos of her on the internet—which of course brings him into conflict with the aforementioned authorities. Though the Grants are certainly at the centre of HEX, and the majority of the novel's horrors unfold in and around the house they call home, several supporting perspectives give us a sense of a town in peril rather than just a family. We hear from Grim, who does a dirty job that someone's gotta do with surprising sensitivity, and from Griselda, a domestic abuse survivor who considers Katherine as a poor pariah. The latter character struck me as a little obvious, if I'm honest—as did a handful of HEX's other elements. The symbolism is, shall we say, somewhat unsubtle; owls—frequently the familiars of witches—flit across the pages on a regular basis; and the pathetic fallacy is in full effect from the first. Then there's the on-the-nose naming conventions Heuvelt favours, which range from the strange—see Steve and Tyler—to the portentous—Grim and Griselda—to the outright pronounced. Distracting as all this is, it doesn't massively detract from the impact of the human horror Heuvelt, having made the unknowable known, opts to hinge HEX on. Small moments, such as the disappearance and ultimate discovery of the doctor's dog, are incredibly effective, at bottom because they take such an emotional toll on the characters complicit in them—like Tyler, in this instance: a sympathetic soul despite his causal role in the whole. Not unrelatedly, Heuvelt is unafraid to endanger his major players, and furthermore, to follow through on that awful promise. There's a moment around the midpoint when a significant figure is summarily slaughtered that serves not just to raise the stakes but to demonstrate that no one is going to come out of this ungodly affair unchanged... assuming anyone comes out of it at all. 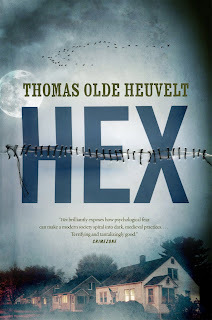 HEX has its issues, admittedly, but it's a difficult thing Heuvelt is attempting to do here, and for the most part, the most promising popular horror author to have appeared on the scene since Alison Littlewood and Adam Nevill makes it look easy. I've seen so many great reviews of this, I feel like I'm missing something, but I finally cosigned it to the DNF pile this morning. For me, it was a case of fantastic concept, horrible execution.